middleeastobserver.org – Informed media sources said that Ahmed Al-Khatib, the adviser of Saudi King Salman bin Abdulaziz, has paid a visit to the Ethiopian Renaissance Dam within the framework of his current presence in the Ethiopian capital, Addis Ababa, to find out the possibility of renewable energy generation. 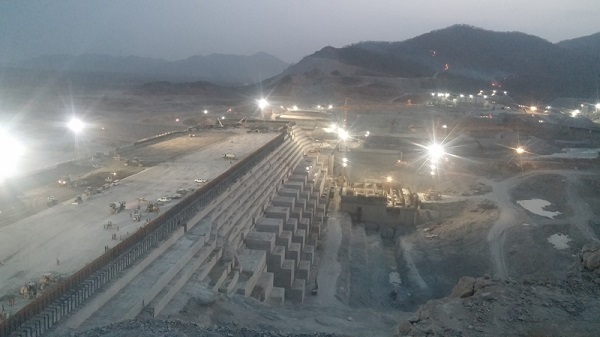 The Ethiopian source, that accompanied the Saudi official to the dam, said that Al-Khatib, who arrived in Addis Ababa Friday, visited the dam on the same day, and was received by the project manager Semegnew Bekele. The visit agenda of Al-Khatib and his accompanying delegation was undeclared, especially concerning the Renaissance Dam, which was not also mentioned by the Saudi Press Agency. According to the official Ethiopian television, the adviser to the Saudi monarch, met yesterday, with Ethiopian Prime Minister Hailemariam Desalegn. The Ethiopian TV pointed out that during the meeting, it was agreed to form a joint committee for cooperation between the two countries in the field of energy. For his part, Desalegn called Saudi Arabia to support the project financially and to invest in Ethiopia, according to the Ethiopian television itself. The Prime Minister of Ethiopia emphasized his country’s desire to cooperate with Saudi Arabia in the fields of energy, roads, electricity, agriculture, as well as cooperation in the field of tourism. For his part, Al-Khatib said that Saudi Arabia and Ethiopia said they had enormous potentials that will enable the two countries to work together for promoting and strengthening their economic and diplomatic ties. Al-Khatib also held consultations with the Ethiopian Minister of Foreign Affairs and pointed out that Saudi investors desire to work in Ethiopia in various investment fields. Al-Khatib’s visit to Ethiopia is the second by Saudi officials within days, where Saudi Minister of Agriculture Abdul Rahman bin Abdul Mohsen al-Fadhli visited Ethiopia last week. In 1948 diplomatic relations between the two countries began at the Chargé d’affaires level, and in 1994, diplomatic representation was upgraded to the rank of ambassador. Saudi Arabia was a major supporter of the military-backed regime in Egypt following the 2013 coup against Mohamed Morsi, the country’s first freely elected president, and has channeled billions of dollars in support of Egypt’s economy. However, since Egypt’s vote on the Russian-backed draft resolution in the United Nations security council, Saudi Arabia and Egypt have started a cold war on media platforms. Egyptian officials, however, are denying any political disagreement between the two countries. Egypt’s vote on October 8 to support a Russian Security Council resolution on Aleppo has exposed an unprecedented rift between Egypt and its strongest Arab ally, Saudi Arabia. The vote triggered the first public condemnation by the Saudis of the Egyptian regime, which they helped bring to power three years ago. The Saudi criticism also coincided with cutting monthly discounted oil shipments to Egypt, a much-needed support for the country’s deteriorating economy. A few days later, Egypt’s Abdel Fattah al-Sisi told military leaders that the cutting of the oil supply was only a commercial matter. However, he warned Egyptians that “fully independent decision-making, independent states endure a lot. What is happening is an attempt to pressure Egypt. Egypt will only kneel to God. The timing of the rising tension, after the UN Security Council vote on Aleppo, may give a misleading impression that the core disagreement between the two allies is about Syria. However, a more careful look at Egypt’s foreign policy under Sisi shows that the divide between the two countries is much larger. Saudi Arabia might have hoped the new Egyptian regime under Sisi would join Riyadh in its prolonged conflict with Iran. Before taking office and during his first few months in power, Sisi hailed the Saudi and Gulf support to his regime and promised a grateful Egypt, ready to send troops to defend the Gulf nations as fast as “the trip between Egypt and the Gulf takes”. Yet, Al-Sisi’s sweet talk never materialized into tangible support. Eight months after taking office, Al-Sisi told his military leaders that “Egypt’s military is for Egypt only and not for anyone else”. Al-Sisi also reflected in his speeches and foreign policy a very different vision from that adopted by the Saudis. Instead of rallying behind Saudi Arabia in its conflict with Iran, Sisi adopted a vision of Egyptian foreign policy designed to protect his regime, maximise its freedom of movement, and diversify its sources of foreign support -even if such goals contradicted with Saudi and Gulf interests and led him to reach out to the Saudis’ main regional rivals, including Iran itself. Egyptian diplomatic sources revealed that Cairo started almost a month ago moves to stop the agreement between Saudi Arabia and Djibouti to build a Saudi military base at the entrances of the Gulf of Aden. Cairo completely rejects this agreement based on the facts that these areas lie in what is considered ‘Egyptian diplomatic influence’, and fall within Egypt’s national security zone as an Egyptian strategic depth in the far south, according to sources. The sources said, “Egypt is worried about a Saudi-Moroccan expansion toward this particular region, particularly after King of Morocco Mohammed VI tour in a number of countries last month, notably Ethiopia which came in parallel with Saudi contacts with Djibouti to establish the Saudi military base on its territory. The sources added that the Egyptian political leadership understands the Saudi move because of Djibouti’s strategic location on the Red Sea at the Gulf of Aden, which comes to increase the pressure cards in the light of the conflict with Iran, particularly in the war led by Riyadh against the Houthis in Yemen. However, the source continued, this move contradicts the common rules and norms pervading among the Arab countries that those areas lie within the Egyptian diplomatic and strategic influence zones because of its direct impact on the water issue, the Nile Basin and the Suez Canal corridor. The sources pointed out that if Saudi Arabia wanted to secure these areas and ensure that it won’t fall under the Iranian control, there is a quite understanding from Egypt of this issue, but it must be made with Egypt’s participation, presence, and supervision. There were several mediating attempts for reaching a reconciliation between the two countries, but there are no indications for their success so far. During his latest visit to the UAE, King Salman arrived hours after the departure of Egypt’s Abdel Fattah Al-Sisi. The Egyptian media platforms expected before Abdel Fattah Al-Sisi traveled to the UAE that there would be a summit organized by the UAE between King Salman and Al-Sisi to put an end to the differences between the two sides, which, to their disappointment, did not happen. Accordingly, it seems that the Saudi side is sticking to its position, especially after Abdel Fattah Al-Sisi has recently announced his support to Bashar Al Assad’s army in the Syrian conflict in his interview during his official visit to Portugal. It also seems that Egypt’s movement to stop the establishment of a Saudi military base in Djibouti will intensify the tension between the two countries. Countries around the world race to establish military bases in Djibouti, because of its strategic geographical location as it lies on the western coast of Bab el-Mandeb Strait, linking the Red Sea and the Arabian Sea. In this context, both the Kingdom of Saudi Arabia and China sought to enter the race in Djibouti which hosts bases for the United States of America, France, Italy, and Japan. Renting military bases is considered one of the most important sources of revenues for Djibouti as it gains almost $ 160 million a year. Saudi Arabia has been steadily improving its relations with African countries. One of its major recent achievements was the improving of relations with Sudan, one of the continent’s largest countries, that was for a long time an Iranian ally.